On 10 Sep 2016, ALWEHDAH youths gathered together to conduct a house-to-house distribution of cash and daily necessities to needy Arab families in the Chai Chee, Bedok and Tampines residential areas. Most of the beneficiaries were elderly living in rental one-room HDB units. This inaugural Eidul Adha "Gift of Love" campaign, spearheaded by the ALWEHDAH Youth Wing, was launched on 17 Sep 2016 and attracted total cash contributions in excess of S$3,000. Rice packs were also generously contributed by the Muslimin Trust Fund Association (MTFA) for this campaign. For the first time, secure credit card contributions were also made possible via the ALWEHDAH website. Working in pairs, ALWEHDAH youths invited beneficiaries to relate their personal difficulties and needs during each house visit, so as to identify gaps that ALWEHDAH could help them overcome. Some of the beneficiaries also related fond memories of their younger days as active members of ALWEHDAH, and expressed their desire to contribute again to ALWEHDAH's activities. ALWEHDAH looks forward to engaging all passionate members in future activities, and praise the Youth for their dedication helping the less fortunate, while forging closer community ties. May we all hold firmly to the rope of Allah as one family, together. Amin! The ALWEHDAH Youth Wing was privileged to be able to conduct and participate in a pre-Ramadhan donation drive, involving about 60 households in the Bendemeer, Boon Keng and Tampines areas. This year, we were glad to be able to work with our partner, Ms. Talha Alkaff, a volunteer who has tirelessly been assisting the needy for many years now. This year, for the first time, ALWEHDAH received a generous contribution of 300 kg rice from the Muslimin Trust Fund Association (MTFA) for distribution. The team also raised private cash donations exceeding S$3,000, in addition to donations of other foodstuffs for the distribution. The spirit of working together, or "gotong royong", was evident during the packing phase, when volunteers from the Youth Wing and friends helped with the efficient packing of bags filled with necessities, as well as during the distribution day, with many of the Youth Wing members contributing their time and effort to a worthy cause. The Youth Wing would like to thank everyone who made this event possible, and are honoured to be given the opportunity to be able to contribute our time and effort for the community. A Moldovan delegation, comprising of government officials with a diaspora and migration mandate, visited ALWEHDAH on 13 April 2016, during their 5-day study trip to Singapore. This effort was supported by the Global Joint IOM/ UNDP Programme “Mainstreaming Migration into National Development Strategies”, funded by the Swiss Agency for Development Cooperation (SDC). The study visit sought to support the relevant Moldovan Government agencies in increasing the institutional coherence and efficiency of the collaboration between the different levels of public authorities and the private sector; and also in developing an effective public-private cooperation mechanism, successfully enabling the engagement of the private sector towards achieving Migration & Development goals, building on the lessons learned from Singapore's experiences. The recently signed Memorandum of Understanding between Alwehdah and UNDP Yemen, supporting the mutual collaboration to promote Yemen our Home projects of interest to the Yemeni Diaspora in South East Asia and fundraise for their implementation. Dr. Saadaldeen Talib, Goodwill Ambassador for UNDP Yemen, was also present to share the history of the Hadrami Diaspora to the East Asian region and Singapore, and the success behind how the diaspora in these regions have managed to maintain close relations with Hadramis despite migration out of Yemen for hundreds of years. At the end of the session, the Moldovan delegation expressed their sincere appreciation for the efforts of the ALWEHDAH committee in hosting them for the sharing session. In particular, Mr. Polosa expressed a keen interest in engaging ALWEHDAH for future IOM events, especially to share the best practices of the Singapore Hadrami diaspora in establishing and successfully maintaining relations with their homeland. ALWEHDAH announced a pioneering collaboration to establish regional support for the United Nations Development Programme initiative, “Yemen Our Home”. This partnership will provide an easy platform for Yemeni Diaspora, based in Singapore and surrounding countries, to extend their support to conflict-ridden communities back in Yemen, through UNDP-led projects. A Memorandum of Understanding (MOU) for the partnership was signed between Mr. Khalid Basharahil, ALWEHDAH President, and Ms. Mikiko Tanaka, UNDP Country Director for Yemen. Ms. Tanaka officiated at the launch, which was attended by more than 100 members of the local Yemeni Diaspora. The MOU specifies the intent of mutual collaboration to promote Yemen our Home projects of interest to the Yemeni Diaspora in South East Asia and fundraise for their implementation. The Bursary Award 2015 Ceremony was held on the 14th of September 2015 at our very own clubhouse premises. Dr Ahmad Mattar, ALWEHDAH Patron-in-Chief, together with Mr Khalid Basharahil, ALWEHDAH President, presented the awards to the 14 qualifying recipients. This year, a special scholarly presentation was delivered by Ameen Talib Book Prize awardee, Nurfadzilah Bte Yahaya’, on her Master's thesis, entitled "Good Friends and Dangerous Enemies - British Images of the Arab Elite in Colonial Singapore (1819-1942)". The event was attended by close to 80 members of the Arab community, who warmly welcomed the efforts of ALWEHDAH in recognizing and supporting the education of our future Arab leaders. 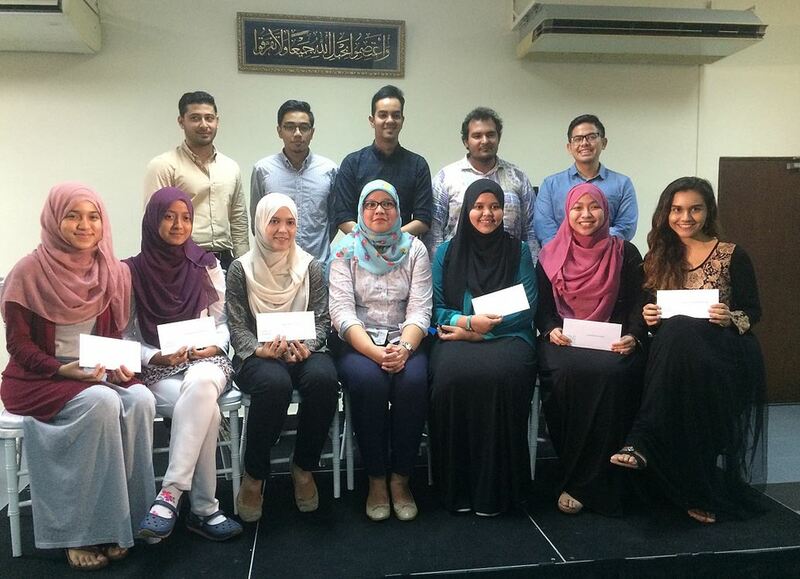 ALWEHDAH Bursary 2015 Awardees & Ameen Talib Book Prize winner, Nurfadzilah bte Yahaya' (seated, middle). 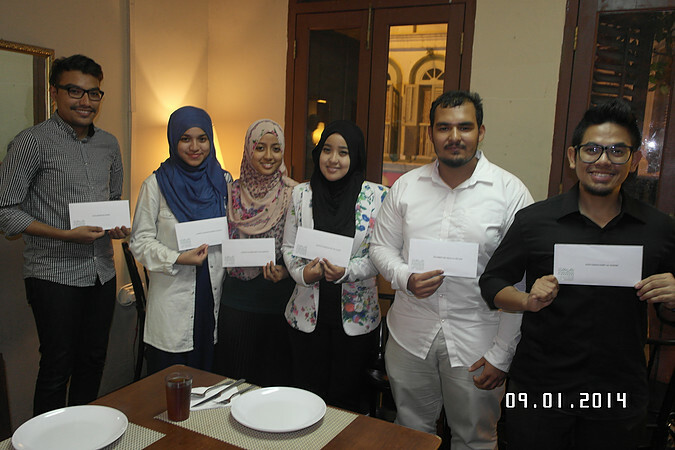 The inaugural prize presentation for the Bursary Award 2014 was held on the 1st of September 2014 at Cafe le Caire @ Arab Street. Dr Ahmad Mattar, ALWEHDAH Patron-in-Chief, together with Mr Khalid Basharahil, ALWEHDAH President, presented the inagural awards to the 6 qualifying recipients. Each bursary award was valued at S$2,000. The ALWEHDAH Bursary Award aims to provide financial support to bright Arab youths who have demonstrated potential for academic success and leadership. The cosy event was attended by several ALWEHDAH members, as well as members of the ALWEHDAH management committee.